I have been making a lot of noise this year about not wanting the summer to end. I love autumn and autumn foods...and I always look forward to each seasonal shift—along with the accompanying shift in foods—with great anticipation. My attitude this year has surprised me a bit. Since I figured my attitude would eventually iron itself out, I have just continued to enjoy the fruits and vegetables of summer with great relish. But yesterday evening, I was served a delicious kale, butternut squash and mushroom salad at the home of a friend. What could be more autumnal than that? 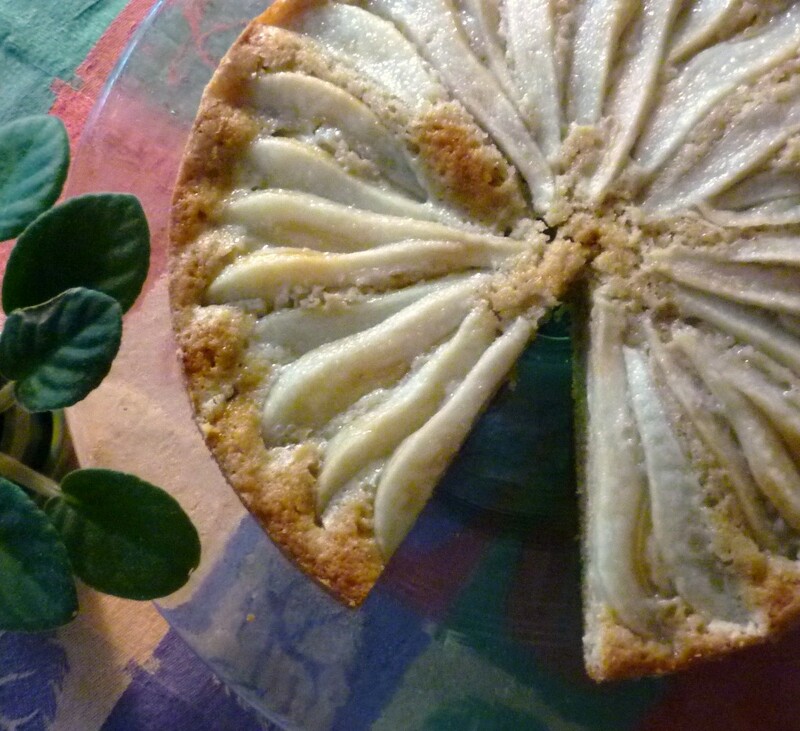 And on Sunday—in preparation for a class—I made a pear and walnut torte. It too was delicious...just what I was hungry for, as it turned out. Suddenly autumn is looking pretty good. Since I don't have the recipe for the salad, I will share the recipe for the torte. I developed the recipe a few years ago for a class that had been advertised as having a dessert featuring fresh figs. As the class approached, it became apparent that there were not going to be any fresh figs...I had scheduled it too late in the season. Pears, on the other hand were abundant and delicious. 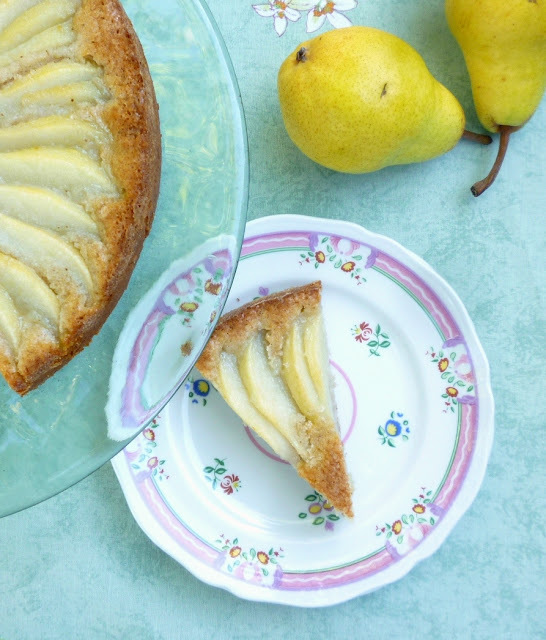 And this cake is all about the pears. When I was working on it, I chose each flavor element because of its natural affinity for pear: a hint of cloves to accentuate the aromatic and subtle spiciness of a good pear, lemon to heighten the flavor and at the same time provide balance to the sweetness of the pears, and finally, slightly bitter walnuts which add a little richness and a nice depth of flavor to what is essentially a pretty light cake. When you take a bite, you might not be able to identify the tastes of clove or lemon or walnut. But you will most decidedly be aware of the flavor and fragrance of the pears. Since the class was to feature stream-lined, weeknight fare, this cake is necessarily a simple one. But this is the kind of cake I like to eat best any way. It is moist, tender and flavorful and doesn't really need adornment of any kind....although, a light sprinkle of powdered sugar, or a dollop of whipped cream wouldn't be a bad thing. 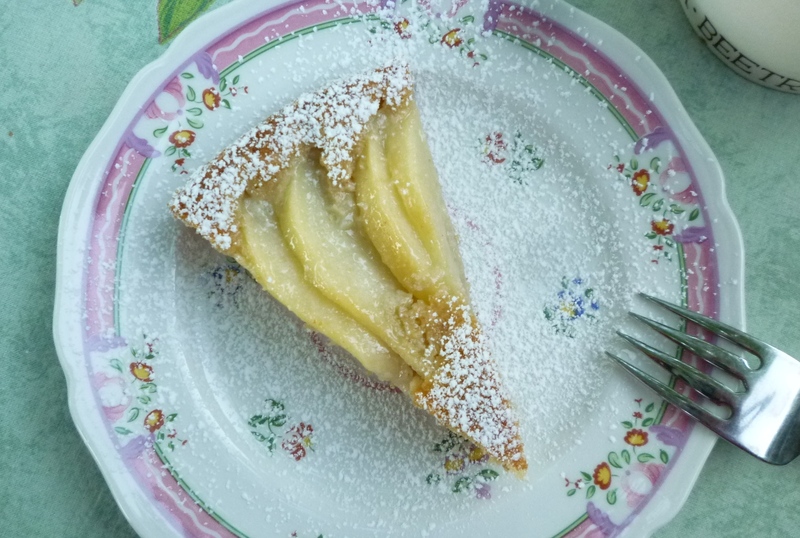 If you happen to have ripe pears on your counter, it is likely your pantry will contain all the other ingredients necessary to make the cake. You could bake it this afternoon and serve it for dinner tonight....sort of a "Welcome autumn...I'm so happy to see you" kind of treat. Grease a 9- by 2-inch round cake pan. Line with a round of parchment and grease the parchment. Flour the pan and tap out the excess. Place the pears in a medium-sized bowl and toss together with the lemon juice and 2 T. of sugar. Set aside. In a small bowl, combine the flour, walnuts, baking powder, cloves and salt. Set aside. Cream the butter with the sugars and zest until light and fluffy—3 to 5 minutes. Beat in the eggs one at a time. Beat in the vanilla. Fold in half of the dry ingredients. If the pears have given up a lot of juice, add this juice, along with the yogurt, to the batter and fold in. Fold in the remaining dry ingredients. Scrape the batter into the prepared pan, spreading evenly. Arrange the pears in a snug spiral on top and sprinkle with the remaining tablespoon of sugar. Bake the cake in a pre-heated 350° oven until a toothpick inserted in the center (in the cake, not the fruit) comes out clean—about 50 minutes to 1 hour. Let cool in the pan for ten minutes before removing from the pan. To remove, run a palette knife around the edge and flip the cake out of the pan. 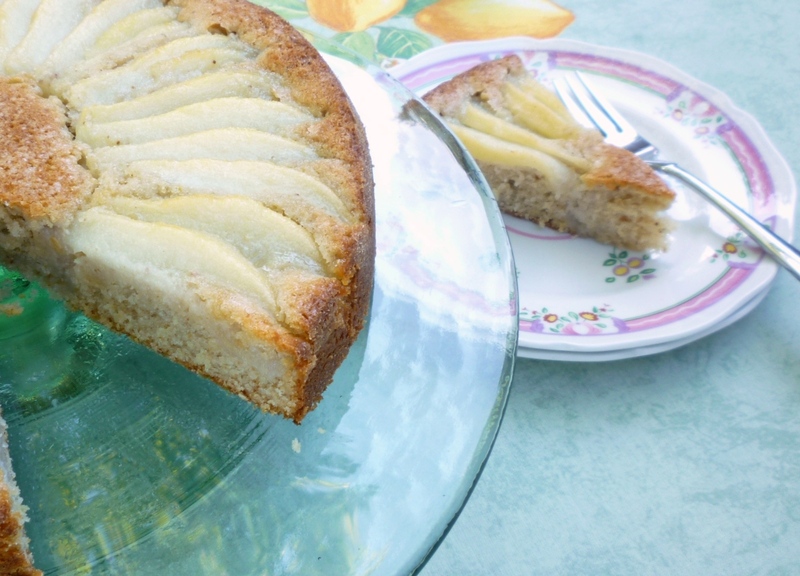 Flip it back over onto a cooling rack and allow the cake to cool completely before serving. If you like, dredge sparingly with powdered sugar before serving. Serve with softly whipped cream or crème fraiche. Serves 8 to 10. Any ripe (but firm), fragrant pear will work well in this cake. Bosc pears—because they are narrow with long necks—will look the most attractive. Wedges of Bartlett or Anjou will leave a gap of plain cake visible in the center of the cake...which still looks very nice. I measured the thickness of my pears at the widest point. If you have 2 pears, you will get about 16 slices per pear...if you have 3, you should get about 12 slices per pear. I love cake and I think I will make this one for our Thanksgiving desert. Will this be best made the morning of? There may not be enough left to worry about how long it will last after that! I'm having your pimiento cheese for my appetizer and your sweet potato and apple puree with roast pork tenderloins. I simpler meal than sometimes, but your recipes have made it all come together. I'm adding a festive wild rice and grapes and brussels sprouts sides and my dinner rolls of course. Thanks for your blog. I obviously find it very delicious. Hi Cecilia! I think you will be happiest with the cake if you make it the morning of...although it is delicious the next day (I think it makes a great breakfast), it is best the day it is made. You can streamline your prep a bit by making the "walnut flour", measuring the ingredients and prepping the pan ahead of time. Your meal sounds wonderful!...and I'm so flattered and pleased that you are making so many things that you found here. I think the wild rice with grapes and Brussels sprouts sounds like a fantastic side dish! You are going to have some happy diners!